Howard B. Austin, spontaneous song-writer of the famous Pawnee Four, has been designated by Governor Horner as "poet laureate." 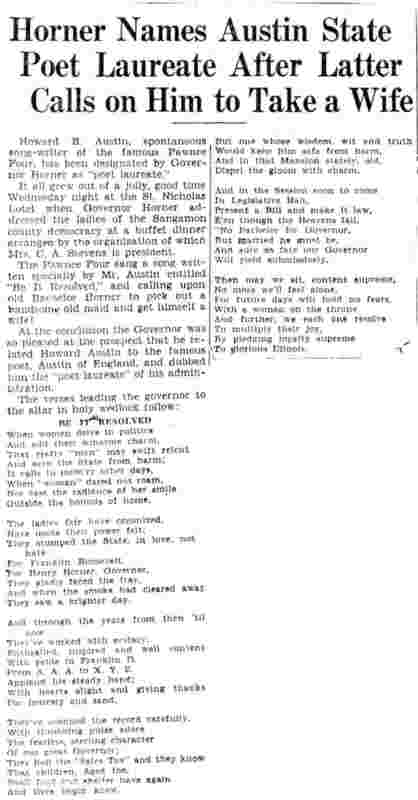 It all grew out of a jolly, good time Wednesday night at the St. Nicholas hotel when Governor Horner addressed the ladies of the Sangamon county democracy at a buffet dinner arranged by the organization of which Mrs. C. A. Stevens is president. The Pawnee Four sang a song written especially by Mr. Austin entitled "Be It Resolved," and calling upon old Bachelor Horner to pick out a handsome old maid and get himself a wife! At the conclusion the Governor was so pleased at the prospect that he related Howard Austin to the famous poet, Austin of England, and dubbed him the "poet laureate" of his administration.